Sixpence For Your Shoe: Cindy and Jared! When we first met Cindy and her lovely mother Marie last year, one thing was for sure, this wedding celebration was going to be quite the party and a large one at that! Cindy and Jared's wedding ceremony would be personalized and sentimental, held in Cindy's childhood Church and the reception would bring a fantastic band, a lively DJ for the breaks, timeless and classic photography, cinematic videography and drool-worthy florals. 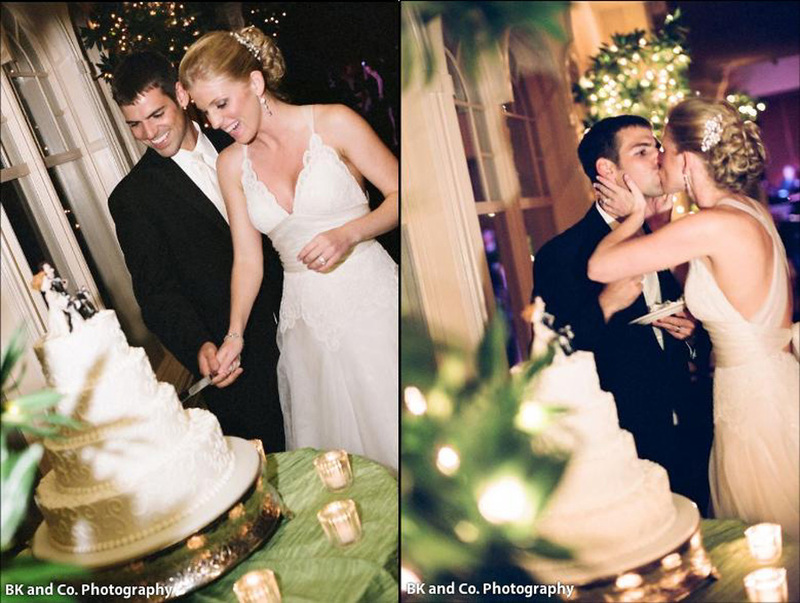 Their friends and family brought the party and the day turned out exactly as they had both always envisioned. 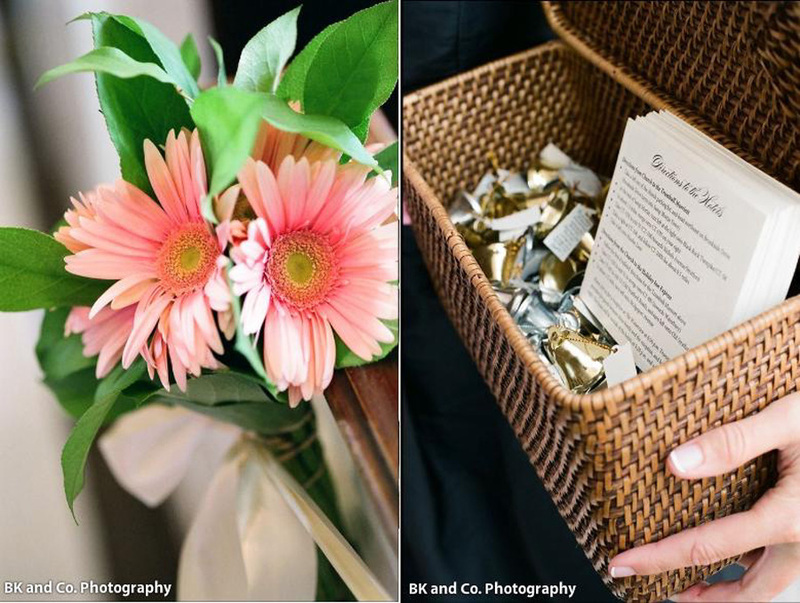 A special thank you to Erin Keirnan from Pamela Benepe, Erin Keirnan and Company for these beautiful images! I arrived to start the day at Cindy's parent's home where the girls were all enjoying themselves. Hair and Make-up artists from two of the state's most sought after salons were helping to further beautify the already beautiful group of ladies! Thanks to Liz and Janice of Naomi Martinez Salon and Amy of Dana Bartone Salon . 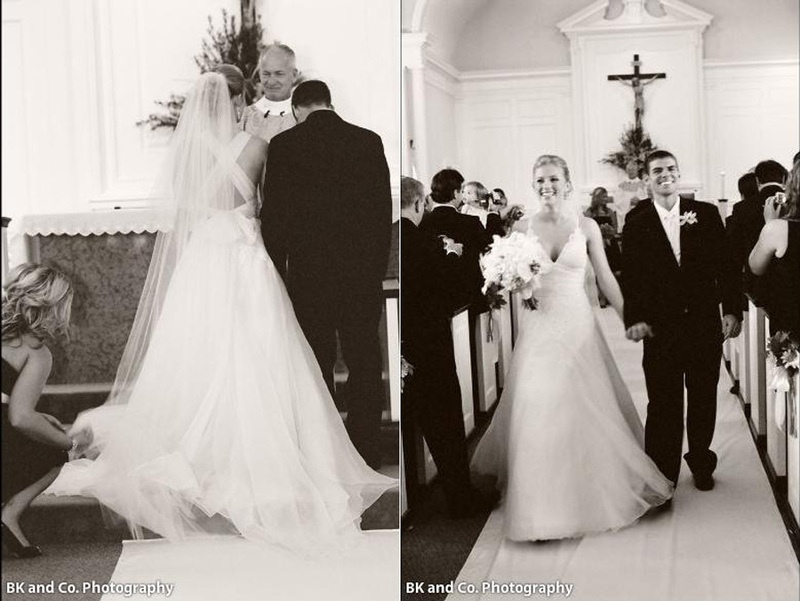 Cindy wore a stunner of a gown by Amy Michelson, purchased at Kleinfeld Bridal in New York City. It was so appropriately titled "Grace" as Cindy it the epitomy of elegance, style, and grace. Cindy's smile and warmth can light up a room. To complete the look, these hot-to-trot Stuart Weitzman's matched her painted toes perfectly! With a color palette selected early on, of various pinks - hot please! 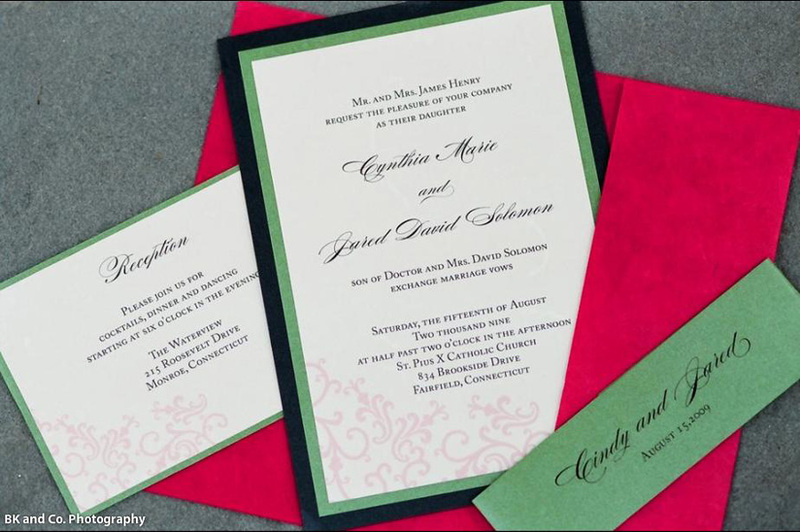 and greens, it was only natural that Cindy, with her meticulous taste would choose to set the stage from the onset, sending invitations in her beautiful wedding colors. All of her stationary was designed by Christina of Paperzest . After my stop in at the house, I arrived at St. Pius X Church in Fairfield to prepare for the ceremony. 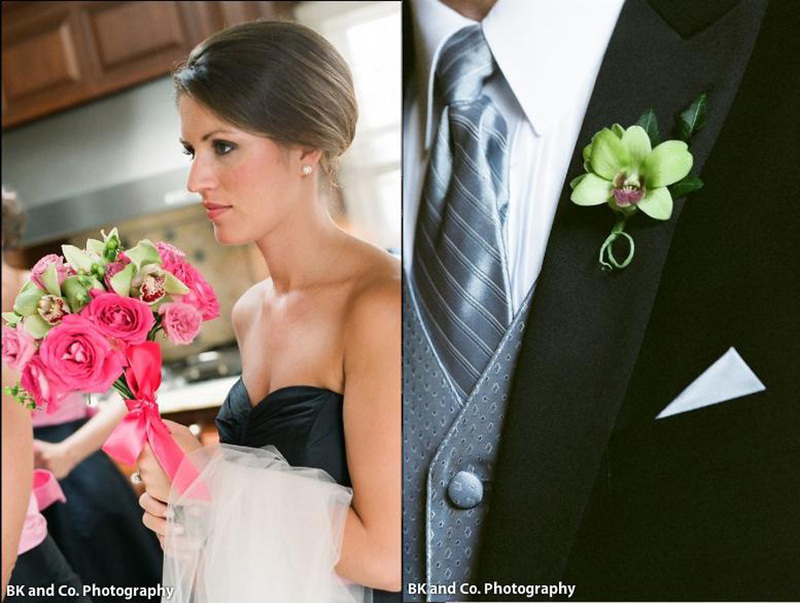 The girls carried boquets of bright pink roses, green hypericum berries, and green cymbidium orchids with dark pink spotted throats. The guys donned matching cymbidium orchids of the miniature variety. 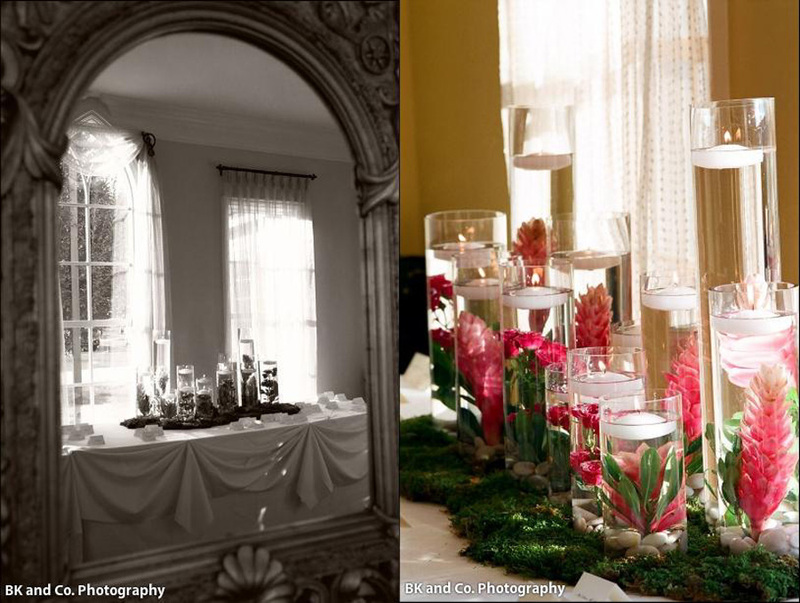 The pews were dressed in light pink Gerber Daisies, a large statement arrangement of hot pink lilies were on the Altar. 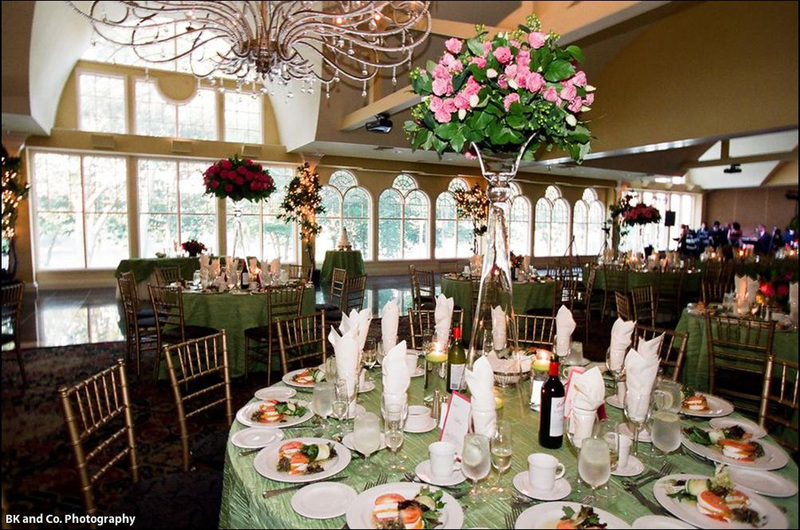 The flowers were provided by Elegant Effects Floral. We love working with Peter and Chris. They know how to go large and do it right! As the ceremony ended, guests were given bells to ring and ribbon wands to wave in honor of the newlyweds as Cindy and Jared exited the Church all smiles! I just had to share this one picture of Cindy with her maids as they all looked fantastic in their Coren Moore black dresses and bright pink sashes. While I spent the first half of the day with Cindy and then Cindy and Jared, Lindsay and our assistant Rachel were over at The Waterview ensuring the reception details came to life. Guests were greeted at the door to this beautiful entrance arrangement of varied height pillars, floating candles and bright florals, grounded with moss and river stones. Upon entering the ballroom space, towering height arrangements, all a bit different delighted guests mixed with various low arrangements of complimentary styles. 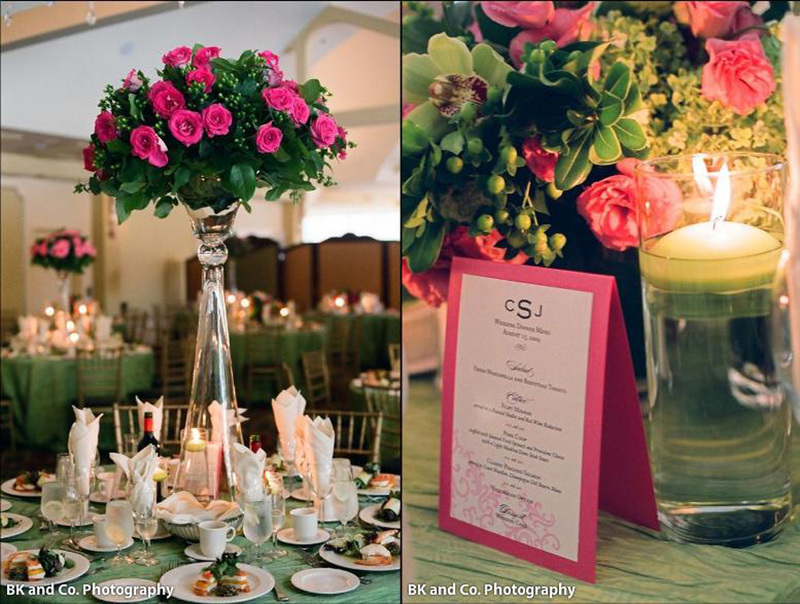 Ribbon textured Celadon linens complimented the color scheme to a 'T". Pillars of water with floating candles and table numbers and menus by Paperzest completed the look. As the sun set, the room glowed! The intros and first dance were not without added excitement. Cindy and Jared knew there crowd - this is one of the most important identifiers to a successful wedding and they were spot on. It was no surprise that the introductions of the parents, bridal party and the newlyweds were a roaring time led under the direction of one of our most highly recommended DJs, Rob from Standing Ovations DJ . He just "gets" it. 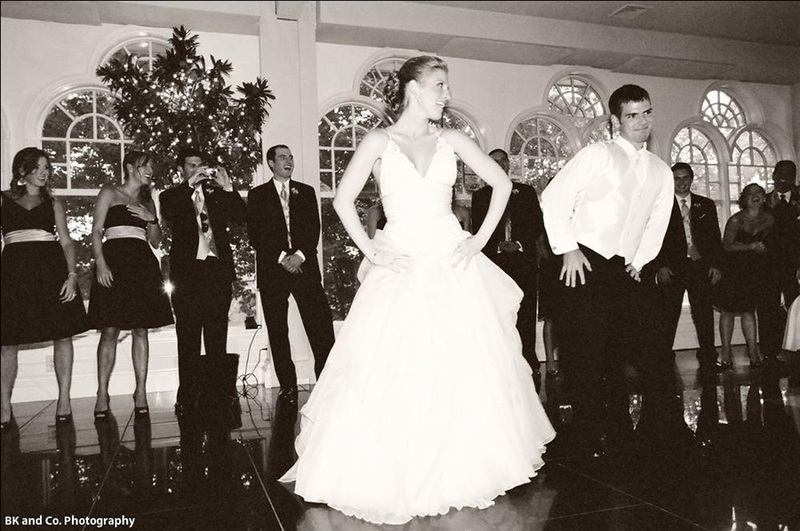 Each couple had a song selected by Cindy and Jared and each performed an act as they made their grand entrance. Following the intros, Cindy and Jared shared their first dance, which at first was as expected, a loving couple, a slow and moving song, a teary eyed crowd looked on, then suddenly, they turned it up a notch and finished with a coreographed number to various upbeat songs that had guests on their feet cheering. They were such sports, everyone loved it. The best man, Jared's brother, Jamie and the maid of honor, Jared's sister, Emily both toasted the couple and Cindy's father gave a welcome that turned into a music video dance act which was truly hilarious. It was so clear how much Cindy's father Jim loves his daughter. 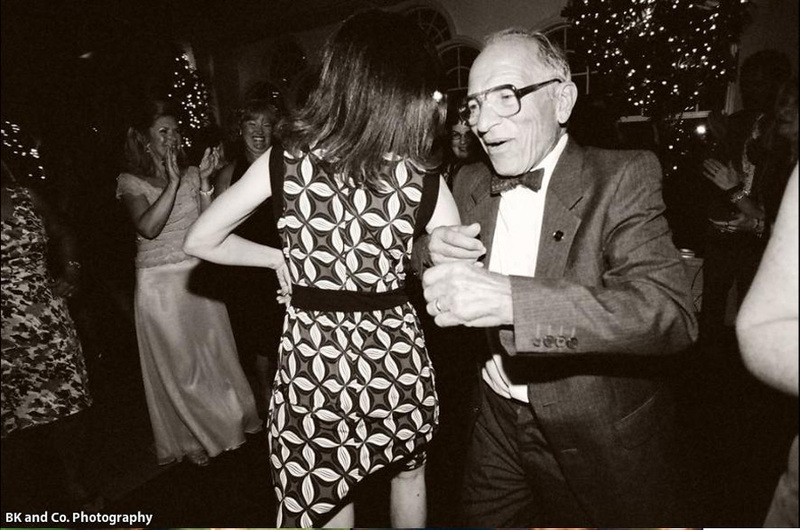 As the night wore on, Guests of all ages danced the night away to tunes played by Heartbeat Dance Band . Barbara is fantastic to work with and her band rocked. Cindy and Jared also delighted guests with a photobooth from Photobooth Planet which was another huge hit! 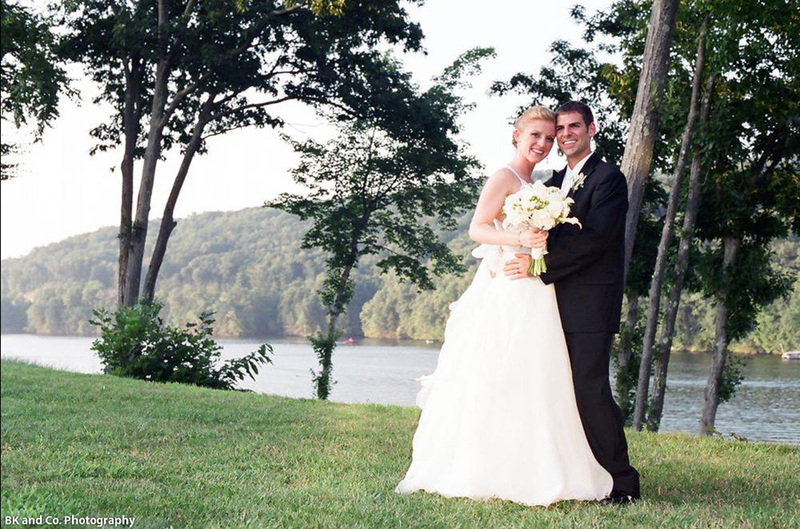 Cindy and Jared, it was such a pleasure working with you and your families to plan your beautiful wedding. You are both wonderful and so much fun. Your wedding was a true testament to your love for each other, your happiness together and the high spirits of all of your friends and family. May they surround you with as much happiness in years to come as they did on your memorable August wedding day. Thank you so much for everything that you did to help make our wedding day so memorable. It was the most fun, incredible day/night of our lives! Sixpence is the best!! thank you so much for the shout out! you did a fabulous job with this wedding. i adore this client, and it's so nice to see what a beautiful day they had.